Traditional bread dipping is home along the northern Mediterranean Sea. Parmesan is ground on a plate and olive oil poured over top. Then sprinkle good aged balsamic vinegar over it and wipe pieces of flatbread like focaccia through this delicious combination. We have made it easy for you. Here at SUNSHINE FARM we have already combined oil and balsamic vinegar at the right ratio. 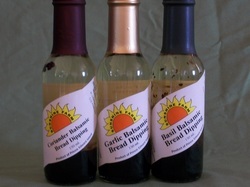 You can use the bread dipping also as salad dressing or on roasted vegetables. Quick and easy.